As Reps who are doing many things, we sometimes need a break from our activities. To make it easy to communicate those breaks, you can quickly complete a form to update your profile and let your mentor know when you will be unavailable for a few weeks or more. 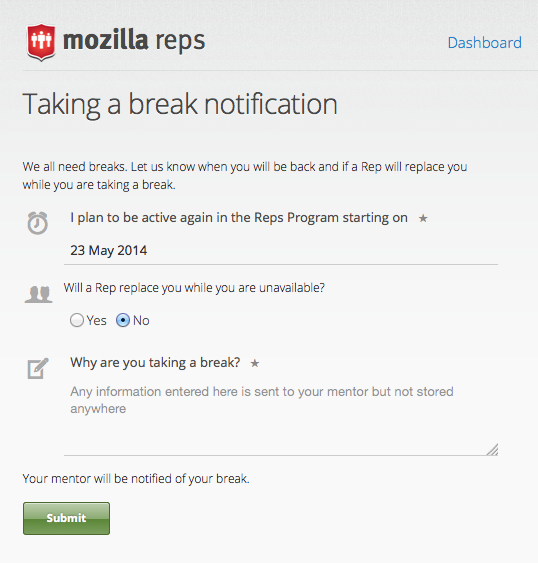 When you want to start your unavailability period, submit a break notification. You can navigate to the form from the Settings page when you are signed in on reps.mozilla.org. At the end of your unavailability period, you will need to indicate that you are ready to resume your activities. 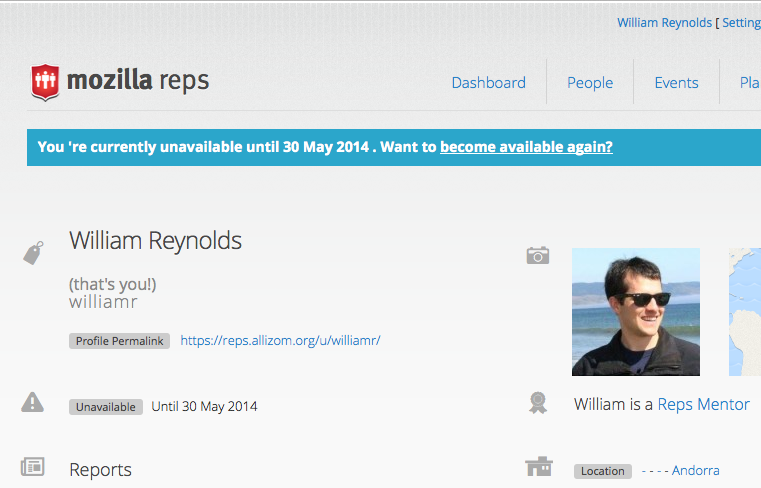 The reminder email will prompt you to visit the Settings page to confirm you are ready to resume your Reps activities. If you need more time, no action is needed. Just return to the Settings page when you are ready and click ‘Resume your activities’. This feature is a result of the planning that happened at the Reps Leadership Meetup in February. Thanks to everyone who helped from the conception to coding to release! If you find any issues or odd behavior while using this new functionality, file a bug and we’ll take a look at it.